Class has virtual methods, so provide a virtual destructor. Base class for stop-word decision functor. 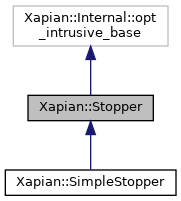 You can hand ownership of a dynamically allocated Stopper object to Xapian by calling release() and then passing the object to a Xapian method. Xapian will arrange to delete the object once it is no longer required.